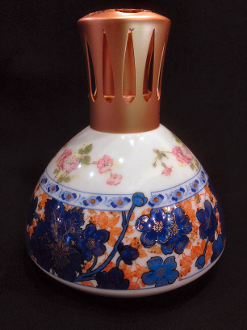 This is a beautiful super high quality old Haviland Limoges porcelain lamp. The Dammouse lamp will find a home in any Lampe Berger collection. Even the bottom of this lamp is completely finished! The Lampe Berger Dammouse lamp comes in the old style Lampe Berger gift box with a burner, funnel and instructions. This lamp is now retired.